Suicide bombings; rocket attacks; bombing raids; asassinations; official reports; posturing; political wrangling. Whatever its bias, mainstream press coverage of the middle east overwhelmingly ignores the daily life of people living under occupation. But without understanding the conditions that Palestinians deal with every day, how can a coherent account of the situation and its attendant crises be attempted? With this in mind, we asked independent journalist Jon Elmer to compile a series of photographs from his three month stay in the West Bank and Gaza. Elmer's work can be found at www.fromoccupiedpalestine.org --ed. RAFAH–This is a view of the so-called Philadelphi Route, the de facto border between Egypt and the refugee camp of Rafah (pop. 120,000), in the southern Gaza Strip. The fresh bulldozer tracks betray the evidence of what the army named Operation Root Canal, a major Israeli offensive in October 2003 during which armoured bulldozers made more than 1500 people homeless in less than 48 hours in this densely populated camp. 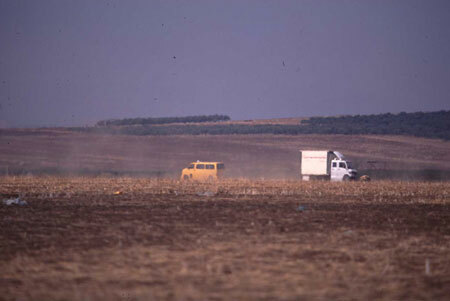 The Philadelphi Route is used as a patrol road by Israeli tanks and is lined by sniper towers that keep constant watch (and often shoot, as you can see on the next spread), and is therefore the crucial staging point for Israeli aggression in the Gaza Strip; since the al Aqsa intifada began in September 2000 more than 370 people in Rafah have been killed, at least 240 of them civilians and more than 100 children. According to the United Nations agency that administers the refugee camps in Gaza, UNRWA, more than 14,666 people have been made homeless by Israeli bulldozers, more than 10% of the camp's population. In Rafah, the violence of occupation is a slow and steady grind. 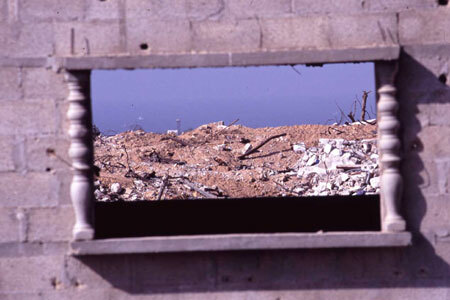 The Israeli army rains bullets into the camp regularly, both from the towers and the tanks–every building facing the Philadelphi Route is pockmarked by thousands of bullets and shells, and the homes facing the border have bricked over their windows to protect their families. The violence is comprehensive. It is massive : tank shells, Apache helicopter missiles, heavy machine-gun fire are regular features of the Gazan landscape. This wall stands on its own amid dozens of razed homes. The violence can also be subtle: a single, precisely placed bullet from a sniper's rifle made a hole in this family's rooftop water tank, draining their only water source in a camp with critical water shortages. 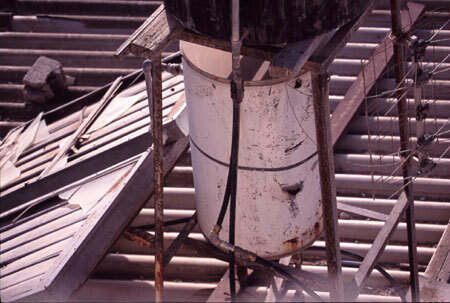 Many of the water tanks we saw had been patched multiple times. ROADBLOCK–The Israeli occupation and military control is maintained through a massive network of roadblocks, trenches and checkpoints. 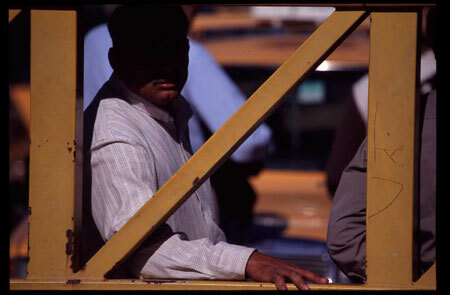 In August of 2003, the UN Office for the Coordination of Humanitarian Affairs counted more than 300 roadblocks in the northern West Bank alone. Virtually every single road in the entire Occupied Palestinian Territories is obstructed in some fundamental way–be it guarded by soldiers, a trench dug across the road making it impassable, or a metal gate. Although justified by the Israelis in terms of 'security', it is difficult to maintain that argument in the face of photographs of unmanned gates. Palestinians I met never made estimates of how long it would take to get through roadblocks and checkpoints, but it typically could take eight hours to travel the 80 kilometres from Jenin to Ramallah. Rough estimates usually provided at least one hour for every 10 kilometres travelled. Closures have forced Palestinians to detour through fields, olive groves, streams and valleys--only some of the examples of how I travelled--to reach their destination. 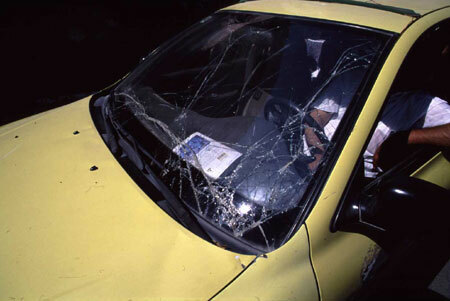 Travelling off road is a dangerous proposition, as the window of this Palestinian taxi attests. JENIN–This is a 'street-school' in the West Bank city of Jenin, a school that is set up in the basement of a mosque or neighbourhood home to tutor children who are prohibited from going to class because the city is under curfew. This means 24-hour house arrest, with with the danger of being shot on sight by Israeli soldiers enforcing the order. 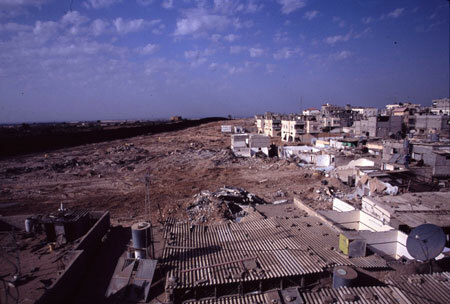 In 2002, Jenin had 175 days of curfew. Street-schools are a way for children to learn, close to home. 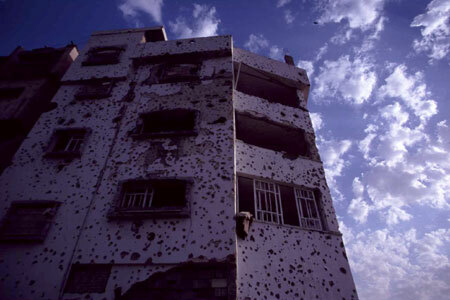 This photograph was taken on the sixth consecutive day of curfew in October 2003. QALQILIYA–Reaching eight meters into the air, the enormous Wall around Qalqiliya (pop. 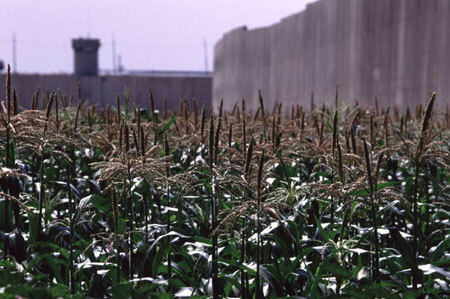 50,000) is protected by a razor wire fence and sniper towers every 300 metres. It has all the trappings of a maximum security prison; a single gate regulates exit and entry into the city, manned by an Israeli guard or locked altogether. 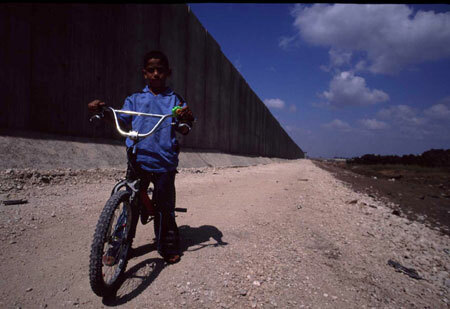 By the time the wall is complete, more than 50% of the West Bank will be annexed to Israel, and the Palestinians will live in three (depending on how you count) walled enclaves, disconnected from one another, with movement at the whim of the Israeli army. 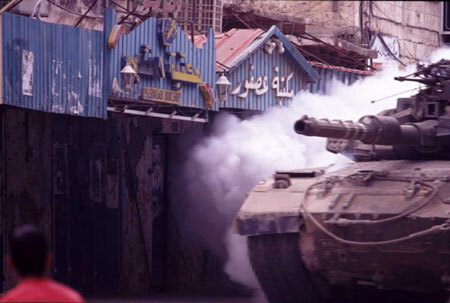 JENIN–Top: A tank, guns blazing, fills the downtown of Jenin with a diesel smokescreen to enforce a curfew order. The enormous trail of destruction left in the wake of the tanks is constant, and it is left to the community in Jenin to clean it up. 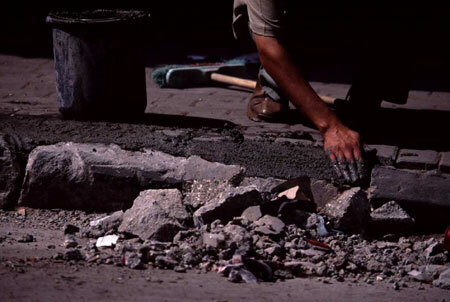 A merchant repairs the concrete sidewalk in front of his store during a break in the Israeli offensive. 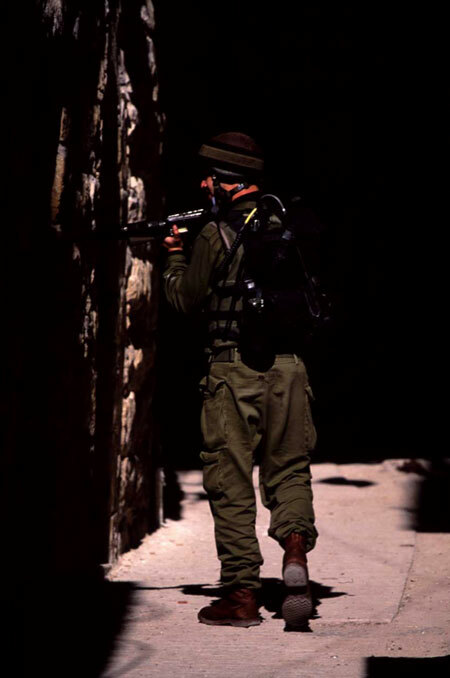 HEBRON–An Israeli soldier patrols house to house in the Old City in Hebron (pop. 90,000). 500 Jewish settlers have a colony in the centre of Hebron that is guarded by roughly 700 Israeli soldiers. The entire city is often put under strict curfew (34 schools are closed) to allow the Jewish residents free movement between their fortified settlement and the holy sites.